MOVA Globes were dreamed up by physicist Bill French in the 1990s. He brought in a former colleague, now MOVA International CEO, Shaw Lin, and a company was formed to bring the solar-powered motion technology to life in a home décor product. We sat down with Bill and Shaw to learn more about the early years, the learning process of starting a business, and their dreams for future MOVA Creations. What was your inspiration behind the MOVA Globe? Bill French: I saw a top spinning and realized I could make a top that would spin when exposed to light. Later I was just challenging myself to somehow make a magical floating version of the earth. I was thinking I could somehow do it magnetically. It would be cool. About that time I saw a “floating eyeball” type of gizmo. I just allowed all of these things to come together in my head at the same time. I am always looking for some new possibility. Walk us through the early years of inventing the MOVA Globe. Did you make the prototypes in your home? Where did you get the materials and tooling? Did you have to invent the tooling as well? BF: I suggested the idea to my wife, Peggy, and, with her approval, started spending nights, weekends, and money to figure out various ways to make the globe spin. I was employed at the time by a company called Recording Physics in Escondido and was allowed to use their machine shop to make parts for prototypes. I assembled the parts in my basement workshop in Cardiff by the Sea. My biggest concern was that the inner ball would not rotate smoothly, but would rattle around inside the outer shell, bounce off the walls. Nature was kind to me. I also did a very extensive patent search, and then filed for patents. Such a search can never prove for sure that there is no prior art, but since I really thought the globe was a cool idea and I knew I had never seen such a thing, I figured there was a good chance nobody had ever made one before. I made quite a few prototypes to find a design that would work in very low light, be reliable, easy to make, and cheap enough. Then I started trying to raise money and start a business. At what point did you realize that MOVA was something truly special – did you have any “Aha” moments? BF: The instant my wife, Peggy, liked the idea. Many of my inventions are techno-gizmos with a very limited market. What was your primary motivation in taking your invention to the next level and developing a consumer product out of your idea? BF: I wanted to get a creation of mine “out there” and to make money. A lot of people ask why there are no lights, sound or digital aspects integrated with the MOVA Globe. Why did you stay away from other sensory elements in the design? BF: I believe Steve Jobs said Apple’s success was as much due to the things they decided NOT to make as to the things they did make. I really agree. All of these things burn energy, cost money, and detract from what the globe is. I really believe we should give customers what we think they should have, not every crazy thing that pops into the heads of a few people. The globe is the ANTI- flashing, buzzing, beeping distracting thing. What led to your partnership with CEO Shaw Lin and what did you two envision for the company? BF: Shaw and I knew each other at Kodak Research Labs. I heard many years later that he was getting things made in Taiwan, so I contacted him to see if he would be interested in working with me. Shaw’s friends were willing to invest money in my invention and in Shaw as a CEO. Shaw, how did you get involved with Bill and MOVA Globes? Shaw Lin: I came to San Diego in 1984 after graduate school to work for Kodak Research Lab and got to know Bill as a colleague. He left Kodak before I did and in 1999 he put together the prototype of a MOVA product and was looking for connections for an Asian manufacturer. Our other Kodak colleague suggested that he contact me and he did. I was very impressed by his prototype and gave him some contacts but they did not work out. Around 2002, I became available and we reconnected. I was able to raise the initial round of seed funding and Turtletech Design Inc. was formed in March of 2003. 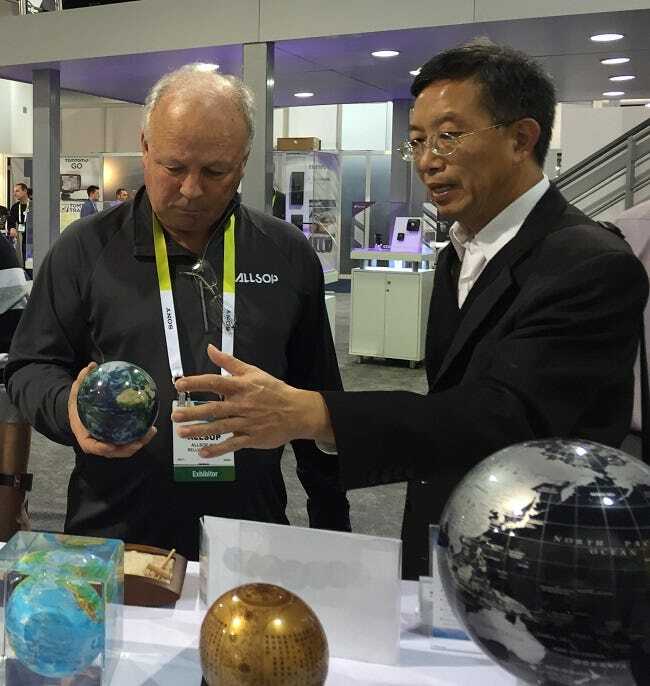 Shaw explaining the globes at CES in 2015. What were some of the challenges you faced when developing the MOVA Globe? Did you ever feel discouraged at any point? BF: Raising money was the biggest challenge. Investors want the next Google, guaranteed. SL: Warren Shih, a current board member, helped me find one investor, my family invested, and three good business friends of mine in Silicon Valley also invested. So kind of a friends and family thing, like many startups. Blind faith! What were those beginning years like of setting up a company? Was there anything especially surprising you came across during the process? SL: Underestimating the difficulty of making perpetual-motion-like products was what made the early years extremely challenging as I constantly had to go out and raise more money, without working products, to fund our learning. At the same time, Bill needed to refine designs and I had to find suppliers and contract manufacturers. Fortunately we were both “young” then. It’s something all startups go through. Where did the names TurtleTech Design and MOVA come from? BF: TurtleTech was just an idea that popped into my head. There is a long history in many cultures of a relationship between turtles and the earth. Turtles move slowly, and solar energy is somehow compatible with that. Also, I was able to get a .com address for it. Shaw proposed the name MOVA [referencing motion and bringing to mind science education]. SL: Bill set up a sole proprietor company TurtleTech Toy to conduct his early R&D. We changed the name to TurtleTech Design to better reflect the brand and products. Turtle is a symbol of moving steadily, and long lasting, thus the name. MOVA came from me– meaning “innovative motion.” We started using MOVA International as a dba for TurtleTech Design in 2015 to give people the stronger connection between our company and the MOVA products we create. Bill French at a show in NY in 2010. How did you come up with the ideas for the initial MOVA Globe designs? SL: Our inspiration came from our planet earth. 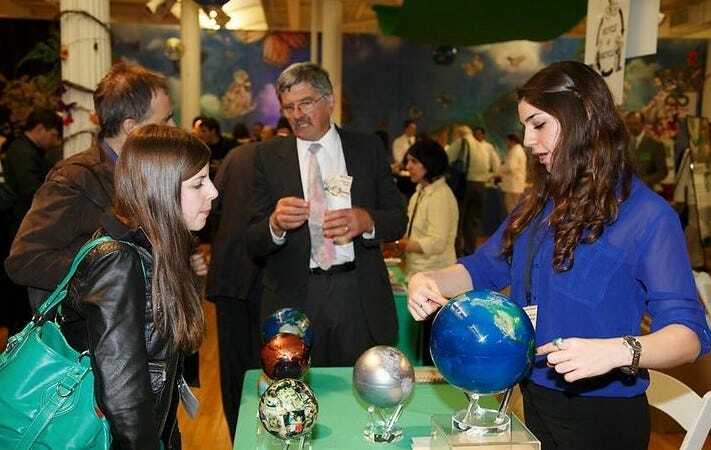 World globes are universal and there are several traditional world globe manufacturers in Taiwan and China who have ready-made maps of different colors and designs. Therefore, our first product line was world globes—maps and natural satellite earth images. How and when did you decide to expand to MOVA Space? SL: This was a natural extension of our world map product line and we had to wait until around 2011 when we had set up an in-house graphics team to make the expansion. 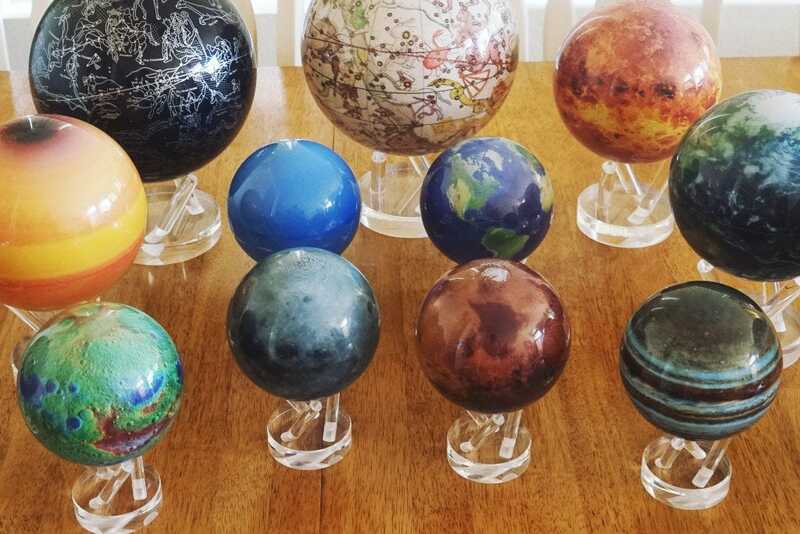 Traditional globe makers did not sell many other planet models so it was up to us to create the graphics and stretch them into spheres to make the MOVA Space product line. What has it been like seeing your invention go from idea to prototype to launch to consumer product sold worldwide? What are you most proud of? BF: I am proud that I invented the globe and actually was able to make it happened. I believe these objects will become a big part of what people buy and put in their houses, worldwide. SL: To see consumers and corporations appreciate our rather high-end MOVA Creations that simply turn magically from within makes me relieved that our vision from the beginning was right— the perpetual motion-like movement is unlike any other traditional movement and it is embraced. Additionally, we accomplished creating our own spherical graphics and have been able to make them ourselves so each MOVA Creation is beautiful from inside out. Have you ever been surprised to come across MOVA Globes somewhere you weren’t expecting? Do you still get excited when you see them in stores? BF: I saw them for sale in the Museum of Science in Tokyo one time, and my family tells me occasionally they have seen one in some exotic place. I do still get excited. SL: Always, the excitement never fades. What is your dream design for a MOVA Globe? Which current design is your favorite? BF: My vision from the start was the Earth MOVA Globe design. My dream is that we make these in a way that they will last forever and sell them priced reasonably enough so everybody on the planet can buy one. Also, I would like to greatly expand the graphics we offer and start making and selling some of the other objects that are covered by our patents. Soon! 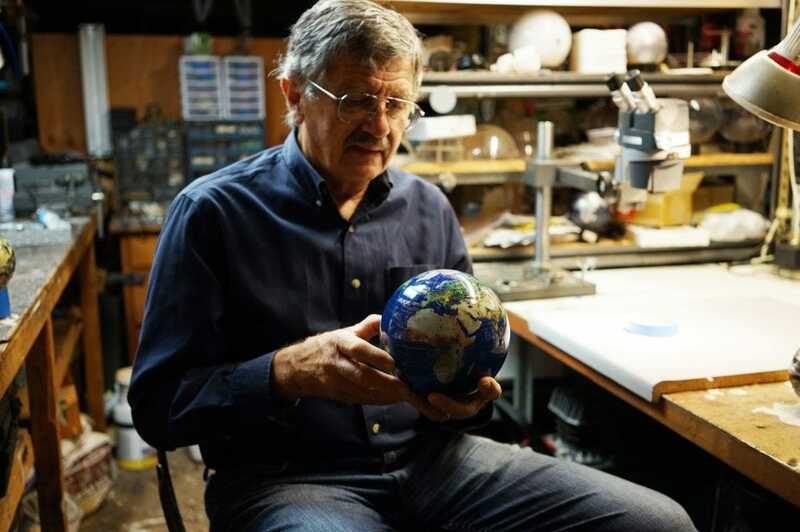 To learn even more about the evolution of MOVA Globes and MOVA International you can read our About Us page and our interview with Bill French about what it means to be an inventor. Still have questions about our products or our company? Head over to our Facebook page and ask your questions. We’ll make sure to do a follow up with Shaw’s and Bill’s answers.